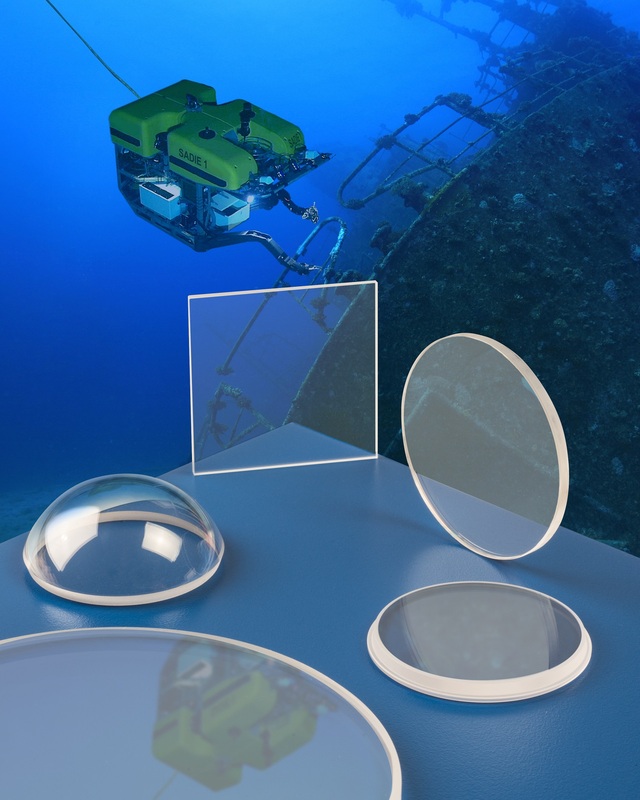 Sapphire optics that can withstand high pressures for outboard applications on undersea vehicles and have a smooth flat surface to help prevent algae growth are available from Meller Optics, Inc. of Providence, Rhode Island. Meller Sapphire Optics feature Moh 9 hardness, which is second only to diamond and can withstand deep water pressure to 10,000 psi, depending upon configuration. Ideally suited for outboard applications on undersea vehicles, sapphire optics are clear, withstand fast moving sand and salt water, and have a smooth flat surface to help prevent algae growth. Available as windows, domes, and truncated hyperhemispheres, Meller Sapphire Optics can be fabricated to customer requirements in sizes from 0.25” to 10” dia. with varying wall thicknesses, elliptical edge shaping, and steps, holes and slots, for mounting. Surface finishes can be held to 10-5 scratch-dig, roughness to £ 0.3 nm RA, and flatness to 0.5 fringes HeNe. Meller Sapphire Optics are priced according to configuration, size, and quantity. Price quotations and complete material specifications are avail-able upon request.